SCVHistory.com | Pico Canyon | Motorists Visit Site Where First Oil Well Was Drilled | S.F. Chronicle 1918. Motorists Visit Site Where First Oil Well Was Drilled. Member of Earle C. Anthony Company Explores Historic Spots in Overhauled Reo. San Francisco Chronicle | Sunday, December 1, 1918. Near the little town of Newhall, thirty miles north of Los Angeles, is the first oil well ever drilled in California. It is located near the head of Pico canyon and was put down more than half a century ago. While hunting deer in the Newhall hills a Mexican named Ramon Perea found a black sticky fluid exuding from the side of the canyon and, through curiosity, gathered some of it in a canteen and showed it to J. Del Valle, who was living on the Camulos rancho (Ramona's home), near Piru. He in turn submitted it to Dr. Gelsich [sic; s/b Gelcich], formerly of Pennsylvania, who pronounced it petroleum. A company was formed for its exploitation and placer claims staked and filed. It was nearly five years later than the discovery before a well was sunk. The old spring-pole method was used, and some ten years later a steam engine was installed and the well deepened. During its early days the well had a production of from seventy to seventy-five barrels a day, and, while it is still producing, it averages slightly less than three barrels per day at present, as the ground has been covered by a forest of derricks which rises from the side of the canyon and extends well up on the ridges. The old steam engine was installed in 1879 and is still in service, being used for pulling tools, but no longer for pumping. 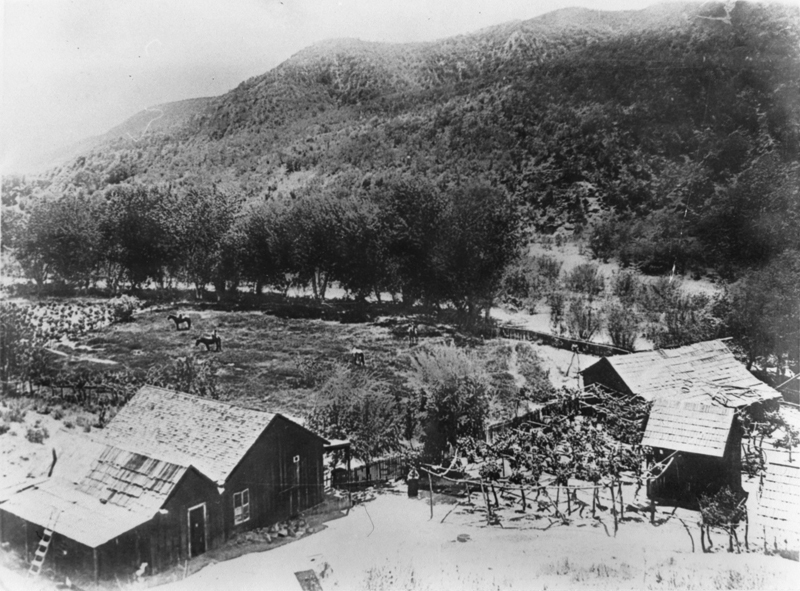 When the original company was formed Perea was given an interest in it for the discovery, but before operations began he traded his interest for a barrel of cheering spirits and a twenty-dollar gold piece, according to old inhabitants of Newhall whose recollections date back to the time when the well was discovered. After the completion of the well, C.A. Mentry was placed in charge as manager, and the little group of houses that sprang up at a point lower in the canyon was called Mentryville. Some of the old shacks are still standing, as is the blacksmith shop that was erected near the site of the well. In this shop all of the tools for drilling the well and operating it were produced. At present it is a fully equipped machine shop, which handles the repairs for a large number of wells that have since been sunk and whose derricks rise like a forest on the sides of the canyon. No. 4, as it is now called, is located well up near the head of Pico canyon, and is reached by a winding canyon road, narrow but fairly good, which climbs upward through a narrow strip of greenery in the bottom of the canyon. The trip of exploration to the site of the birthplace of California's oil industry was made in a Reo six by a member of the Earl C. Anthony, Inc., organization, using a car that had been taken in exchange and overhauled and refinished for the used car department stock. While the grades are steep in many places and all of the canyon road requires a steady pull, the trip was easily negotiated. Along the canyon were a number of broader places where the green grass under spreading oaks extended alluring invitation to stop and picnic. To reach the Pico canyon the road is taken which turns to the left from the boulevard on the northern limits of Newhall, just where the highway jogs toward the railroad, and the telephone line followed to its end. The old still is located on the south side of Newhall, and is easily found by taking the road paralleling the railroad and going south to a big tank and then turning once more to the left through a gate and past a pumping plant. The still lies at the foot of an oak-covered hill just below a big tank on the ridge above. According to oral tradition, it was about 1855 when Ramon Perea started hauling asphaltum out of Pico Canyon and bringing it to the Mission San Fernando, where Andres Pico was in residence. Perea ended up a rancher in San Francisquito Canyon, where his body eternally rests.